Gaetano Berardi is tackled by Floyd Ayite. We round up what Leeds United fans are discussing on social media. @_ROTSS_. 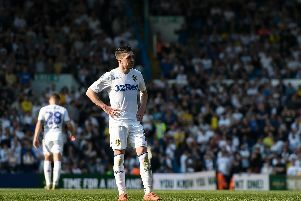 For me there are numerous individuals who don’t want to be at #LUFC, the quality of the team is minging but it’s no way near as bad as the performances shown. No fight, passion or responsibility in performance. Can’t see where the next win comes. Draw/ Loss for me against s’land.